Travel with Kevin and Ruth! : Grizzly bear sighting! You may have noticed that we haven't mentioned a lot of animal sightings lately. That's because we haven't seen any! Well, that's not totally true. We saw a couple of caribou off far in the distance on the Top of the World Highway. And a few rabbits and other small mammals. But other than that, we hardly saw anything all the way up to Tuktoyaktuk and back... and we hadn't seen a bear for over a month! See the vehicles parked off to the right up ahead? This is why they were stopped! So the other people were parked right at the side of the road. But there was a roadside pulloff directly opposite, so that's where we pulled in. But of course as more vehicles drove up to that area, more vehicles stopped to watch the bears. At one point, there must have been 8 or 10 vehicles pulled over, blocking the road right off at times. We couldn't figure out why they didn't just pull into where we were. But, whatever. Then, people would get out of their cars to get better photos of the 3 bears. Yes, there was a mom, and two of last year's cubs. At least the guy is wearing a helmet. He might survive a bear attack, not the woman though. We couldn't believe how many people simply got out of their vehicles. The bears were only about 50 yards away. Maybe they didn't realize that bears can run at 50 km/h (30 mph). It would cover that distance in about 4 seconds! We viewed the bears from Sherman's rooftop! But, you can only watch the bears for so long. We continued another couple of kilometers to the Soldier's Summit where the original Alaska Highway was officially opened in November 1942. Just a short hike to Soldier's Summit. Great view looking back at Kluane Lake. Where the original grand opening of the Alaska Highway took place in November 1942. Little did we know at the time that we would be flying over those mountains today! Sheep Mountain. Because of the Dall sheep who live on it. We decided to take a 5 km (3 mile) detour down a well maintained gravel road to the ghost town of Silver City. The road to Silver City ghost town. Lots of old log structures. Apparently they used to breed foxes here! Sherman loves exploring with us! What is left of this old truck. We were only about 40 kms (24 miles) from the town of Haines Junction. And we were getting low on food and we were totally out of beer and wine! But, there are so many great opportunities for boondocking that we didn't want to pass it up. We tried going down this one trail, but ended up pulling over. I walked the rest of it, and it led to a fantastic overlook, but Sherman would have had a tough time getting down there and I would have had to get out my machete to cut back some vegetation. So, we got turned around. You have to know your limits! We turned around and went back out to the highway. A short distance further on, we came to a little laneway leading down to a spot by Sulphur Lake. And, using our weBoost Drive 4G-X RV antenna we were able to get a usable cell signal 40 kms (24 miles) from town. There was a message waiting from Dan and his wife Isabelle who have been reading our blog for a couple of years. They have been in contact several times during this trip and we've been hoping to bump into each other. This time, they were only about an hour away! Ruth took this shot of a female Barrow's goldeneye duck. So, Dan and Isabelle showed up and we had a good chat. They have their house up for sale and bought a 30 ft Class A motorhome in the spring. Lots of great conversation, and they're about the same age as us. I'm sure we'll see them again in the future! 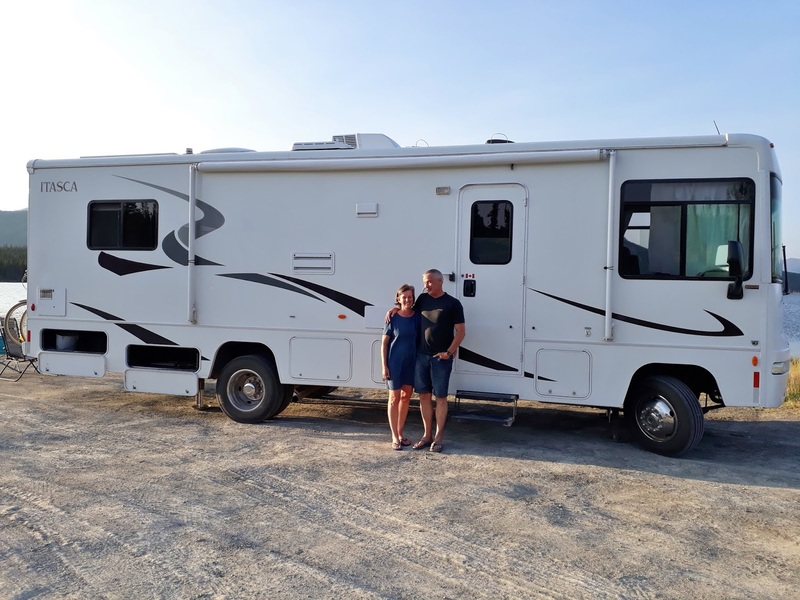 Isabelle and Dan with their motorhome. While we were all together, I received a late email from our friends at Yukon Tourism asking if we could be at Silver City airport for a 9:00am flight to a glacier. Yes, we could! It was only about 20 kms (12 miles) north. In fact, we asked Isabelle and Dan if they wanted to join us! We wouldn't know until we got there, but there might be two empty seats that they could buy. You'll have to wait until tomorrow's blog post... don't miss it... it's spectacular! Yep, and it was another spectacular flight too! Enjoy your fun times with your blog followers and your Glacier flight. We just had to shake our heads at them. What bothered me the most was when I saw a young couple get out of their car and leave it on the other side of the turnout and then walk across the road and up to near where the bears were with her carrying a small baby in her arms and him carrying a toddler straddled on his hip. They would not have had a chance if the bear went after them! If you want to see a grizzly in the wild George, you are going to have to take a trip out west like any of the northwestern states, Alberta or British Columbia or up north. The bears are a strange colour and yes, some people are stupid! The header picture is lovely. Grizzlies come in many different colours. This one would be considered light brown or blonde. Sometimes you just can't fix stupid! We saw a gaggle of people, on the back roads around Banff, watching a big momma black bear and her 2 cubs about 20 yards from the road eating berries. They were all standing there in a loud group, laughing, taking pictures, marveling at nature. We pulled up beside them and said just that..."do you guys realize how fast that bear could be on top of you." They just looked at us like we were crazy, shrugged their shoulders. went back to their bear party. Stupid is as stupid does. Yep, there are a lot of people that just don't understand the speed and strength that these bears have and unfortunately if something happens to one of these people, then the bear ends up being shot, it just doesn't seem fair! It was very nice meeting you, we enjoyed your company. We'll see you again. Cheers! I hope that we can met up again in or around Kathleen Lake area in a day or two. It would be fun to do a hike together. Glad that you are enjoying our during and our pictures of it. Soon you will be off exploring too! What's causing the white colouration in Kluane Lake - mud? Where you see the white colouration it isn't water but dried up silt. The Kaskawulsh Glacier used to feed into the Slim's River which then flowed into Kluane Lake until 2016 when it decided to cut a different channel and now it feeds into the Kaskawulsh River then into the Alsek River and finally emptying into the Gulf of Alaska. So now that shallow part of the lake where earth and slit was pushed down from the melting water during the summer months has just dried up. Thanks - sometimes we see features like this on our aerial images at work and aren't sure what to call them. Those people must be thinking of “Goldilocks and the Three Bears” LOL, really sad that they don’t realize it’s the bears that get the short end of the stick in a wrong encounter. Thanks for clarifying the white coloration of the lake...learned another new thing! Great pics as usual! I suppose any of us who venture Out and About see stupid people doing foolish things (or the other way around). Bison is another species that people should give plenty of space, but we've seen folks (kids, fer cryin' out loud!) get WAY TOO close while they get that important picture, never mind the hazard. Use your noggins, people!